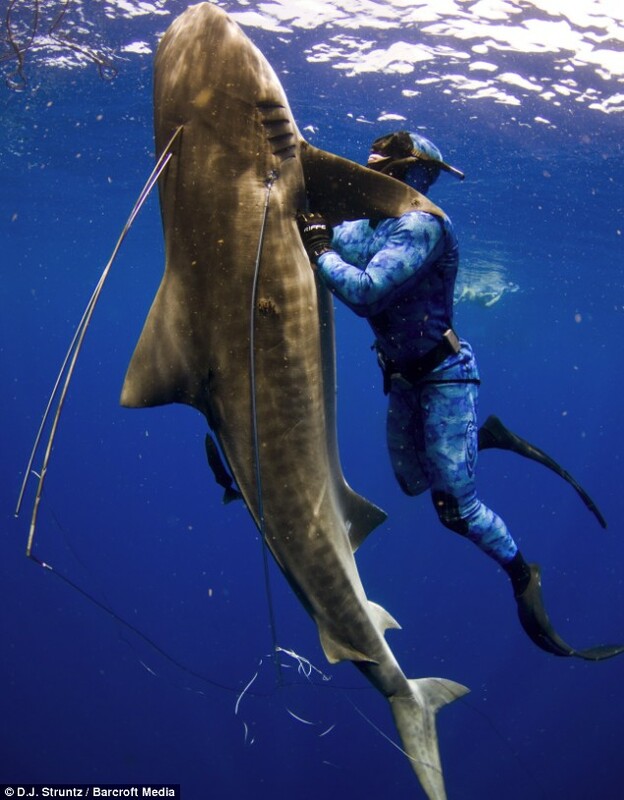 Plunging a knife in again and again, diver Craig Clasen grapples with a 12ft tiger shark to protect a friend. For two hours he wrestled with the giant, spearing it seven times, even drowning the beast before eventually finishing it off with a knife. 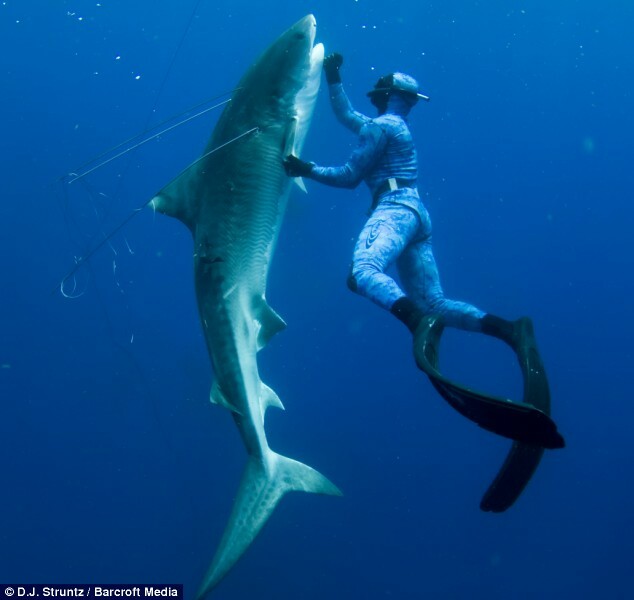 The group were about to leave the deep waters south of the Mississippi River’s mouth, when Ryan McInnis found himself alone in the company of a tiger shark. With no time to lose, Clasen grabbed his speargun and swam to his stranded friend, who was being circled by the giant predator. ‘I positioned myself between Ryan and the shark and I tried to watch it for a second, hoping it would pass us by,’ explained 32-year-old Clasen. Clasen has been free diving and fishing since an early age. Hailing from Mississippi, he was brought up in a fishing family, and is an expert in all fishing disciplines. 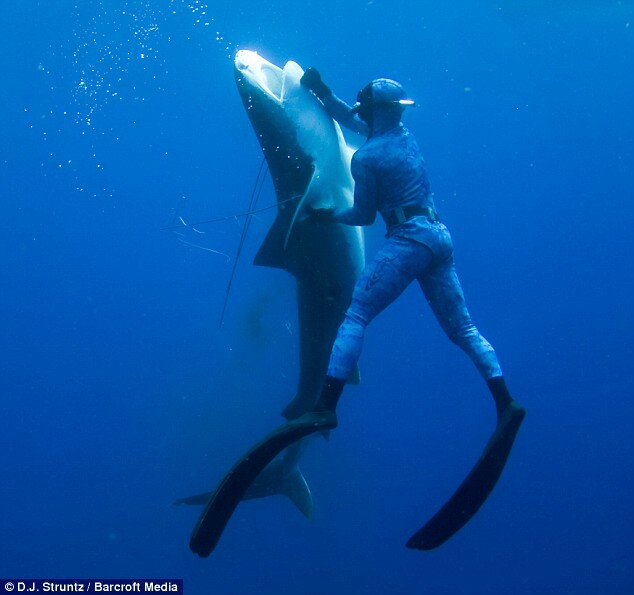 Despite his experience, Clasen took no pleasure in disposing of the giant shark. ‘This was one of the most remorseful moments I have ever had in all of my years in hunting, gathering and fishing,’ explains Clasen. This guy has the best attitude. You should watch the video. Former Marine and wheelchair athlete Jake Hipps is among twelve athletes now featured on Cheerios boxes. Hipps autographed dozens of Cheerios boxes for fellow vets and his co-workers at the Buffalo VA Hospital. Hipps, a Vietnam-era vet, lost his ability to walk after a shooting in 1994. Shortly thereafter, Hipps began competing in the National Veterans Wheelchair Games. He holds four national records in field events and won three gold medals and one silver medal at last year’s competition. Hipps has also competed in skiing events, basketball, and bowling competitions. He’s currently learning to SCUBA dive.